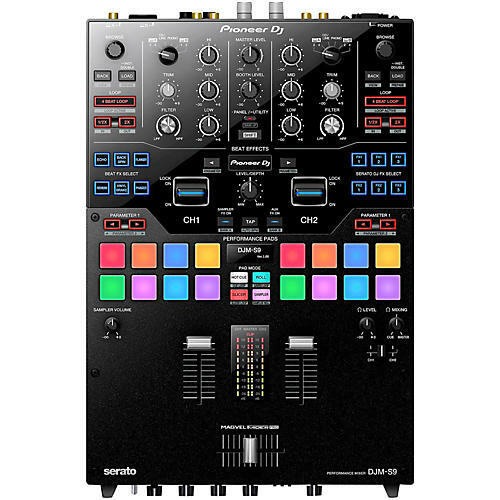 Pioneer's first 2-channel battle mixer for Serato DJ features the fully-customizable Magvel Pro crossfader for outstanding response, durability and smoothness. Dial in its operational load and modify its curve and reverse configuration to suit your DJ style. Tactile multi-color performance pads let you tailor the mixer according to your preferences. For dynamic live mixing, 16 multi-color touch pads give access to hot cue, Roll, slice, loop and more. Their optimized shape and seat switch connections provide great accuracy and response, while the EL display instantly shows which mode is in play. In Serato DJ you can map other functions to the pads and allocate specific colors for an even stronger visual cue. Six customizable buttons on each side of the mixer, and two in the middle, trigger effects directly on your hardware. Fire up six dedicated beat effects on the left banks, or replace them with other popular on-board effects. On the right, you can map your favourite Serato DJ effects and their parameters. The OEL display puts the effect types and beat settings at your fingertips. A high/low pass filter on each channel lets you manipulate effect by simply rotating the knob. With Serato DJ you can switch to other filter effects like dub echo, noise and pitch. The mixer has two large style levers that allow you to swiftly turn effects on and off. Give more dynamics to your sets by triggering effects briefly, locking them on, or exiting arrangements quickly.